Through the humanitarian consequences process, a number of young diplomats learned about, and with the Ban Treaty, began to address the urgent dangers posed by nuclear weapons. South Korean President Moon’s brilliant diplomacy has walked us back from the brink of cataclysmic war and for a time has tied the hands of Trump and his war cabinet. There is still life in the United States. Popular pressure led more than 80 members of Congress to co-sponsor legislation to remove the president’s ability to launch nuclear weapons on his sole authority amidst a tantrum. Members of Congress have also co-sponsored legislation to prevent an unconstitutional war against North Korea. And the legal noose around Trump and his corrupt coterie is tightening. However, we still face challenges. Our international disarmament movement isn’t concentrating enough on the urgent necessity of preventing nuclear war or immobilizing the structures of power that drive their nuclear preparations. Add to this the disturbing parallels between current global dynamics and those preceding World War I. As was the case just over a century ago, this is an era of rising and declining powers — the Thucydides Trap of arms races with new technologies, of resurgent nationalism, territorial disputes, resource competition, complex alliance arrangements, economic integration and intense economic competition, and wild card actors from Trump and Bolton to Al-Qaeda and Netanyahu. No wonder the Bulletin of the Atomic Scientists moved the hands of the Doomsday Clock to two minutes to midnight, the closest to apocalyptic nuclear war since the clock began in 1953, worse than during the 1962 Cuban Missile Crisis. With references to the Trump administration’s Nuclear Posture Review, designed to reinforce US first-strike war fighting, the Bulletin of the Atomic Scientists decried the increased US reliance on nuclear weapons; its staggering investments in new nuclear weapons which are driving the “modernization” of the world’s other nuclear arsenals; the return to Cold War rhetoric and total absence of US-Russian arms control negotiations (as the New Strategic Arms Reduction Treaty winds down toward its expiration in 2021, and the Cold War ending Intermediate-Range Nuclear Forces Treaty looks increasingly fragile.) They warned about the dangerous lack of coherent US foreign and military policies that undermine global security, North Korea’s nuclear weapons program; South Asian rivalries; and Trump’s threat to the nuclear deal with Iran. That was before John Bolton became National Security adviser and the head of the CIA, and Mike Pompeo the secretary of state. Recall that Bolton wrote that a first-strike attack against North Korea would be legal, and both men join Trump in their commitment to undo the Iran nuclear deal and, in alliance with Saudi Arabia and Israel, press Iranian regime change — perhaps militarily. The US is not the only culprit. In response to NATO’s reckless expansion to Russia’s borders, Moscow is compensating for the United States’ overwhelming conventional and high-tech military superiority by building its own new generation of omnicidal nuclear weapons and the missiles to deliver them. It is supporting right-wing racist authoritarians from Prague to Pennsylvania Avenue in Washington, DC, and it has reasserted itself in Syria, where the dangerous proximity of US and Russian warriors could result in an incident that could lead to uncontrolled escalation. We can be hopeful that the extraordinarily successful summit between North and South Korean leadership will lead to a “freeze-for-freeze” arrangement with Pyongyang halting its nuclear and intercontinental ballistic missile testing, and the US, South Korea and Japan halting their regime change-oriented joint military exercises and a reduction in sanctions. But this arrangement will leave North Korea as the world’s ninth nuclear weapons state. Over time, freeze-for-freeze could lead to a peace treaty to replace the 65-year-old Armistice Agreement and ultimately to a North East Asian nuclear weapons-free zone. But it could also reinforce Japanese and South Korean ambitions to become nuclear powers. Shinzō Abe, his possible successor Shigeru Ishiba and the Japanese military say that the Japanese constitution permits them to possess nuclear weapons. And since the fall of Park Geun-hye, the right-wing South Korean opposition has pressed revive the nation’s pursuit of nuclear weapons. We know about the dangers of accidental nuclear detonations and the possibility of nuclear war resulting from miscalculations. Think about the provocative escapades of Russian pilots buzzing US warships in the Black and Baltic Seas; about Japanese, Chinese, American and even Australian confrontations in the South and East China Seas, and the increasing military tensions over Taiwan. It’s not enough to bank on the Nuclear Weapons Ban Treaty. The correlation of power is such that the structures and systems of power and privilege in the nuclear weapons states are not going to simply melt away. To be overcome or transformed, they must be challenged by intense and not always polite international pressure — possibly including a sanctions regime — or by powerful popular pressure from within their own countries, much as we saw in the Euromissile and Freeze movements of the 1980s. This will have to be done with regard to Russia and China, as well as the US. Furthermore, Indian-Pakistani tensions haven’t lessened, and as Reiner Braun, co-president of the Nobel Peace Prize-winning International Peace Bureau warns us, there is rising militarism across Europe, with Angela Merkel, Emmanuel Macron and their minions looking to a European bomb. And, as we see from the indefinite postponement of the UN High Level Conference on Nuclear Disarmament, despite the Ban Treaty, nuclear disarmament diplomacy is in shambles. Finally, even as we celebrate the achievements of the Ban Treaty and the International Campaign to Abolish Nuclear Weapons’ Nobel Prize, we lack a meaningful strategy beyond faith to win the nuclear powers’ signing and ratification of the Ban Treaty. And, as Austrian Disarmament Ambassador Susanne Hammer and former UN High Representative for Disarmament Sergio Duarte urged, beyond the Ban Treaty, we still need to do the demanding work of bringing them into compliance with their Article VI Nuclear Non-Proliferation Treaty obligation to negotiate the complete elimination of their nuclear arsenals. We must remember that the Ban Treaty is not a nuclear weapons abolition treaty. This is not a game of Model UN; humanity’s survival, power and privilege are all at stake. As Ban Ki-moon told us on the eve of the 2010, governments alone will not deliver us a nuclear weapons-free world. It can only be achieved with massive popular movements from below. To prevent nuclear war and to win nuclear weapons abolition, we must strategize on the basis the power relations arrayed against us. Even as friends press the signing and ratification of the Ban Treaty or work for Jeremy Corbyn to become prime minister, we need to focus on preventing the increasingly urgent dangers of nuclear war. Naming and confronting those dangers can serve as the basis for building the people’s power to contain and overcome the nuclear powers. Even as Washington and Moscow diplomatically spit on one another as they did at the UN several days ago, as during the Cold War, we need to press them to resume nuclear disarmament negotiations, beginning — as Moscow has urged — by extending the New START Treaty and its verification requirements. 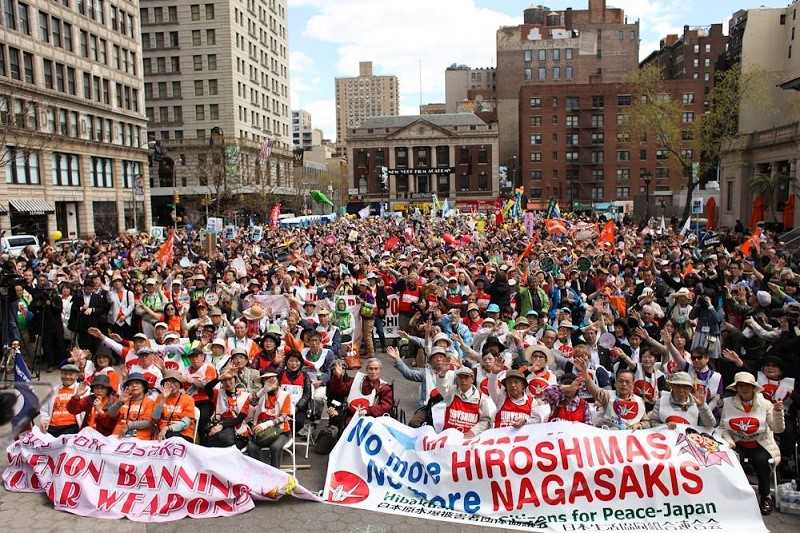 To build the movements we need, we will have to move beyond our single-issue nuclear disarmament silo. We need to identify and make common cause with peace, justice and environmental forces in our countries that are struggling for human rights, jobs and housing security, and to contain and reverse climate change. Lastly, while there is no legitimate rationale for the possession and threat to use nuclear weapons, to move the nuclear powers, we must also to address the fears and ambitions that undergird their nuclear arsenals. This means once again exploring the concept Common Security diplomacy that brought the Cold War to its end. It may also mean building on the legacy of E.P. Thompson and the European Nuclear Disarmament’s inspired West-East nuclear disarmament movement-building that built bridges at the height of the Cold War.